Private lessons for adults and children. Skiline Just enter your lift card number. Shows where and how far you've skied. Studio for 2-3 persons with own entrance. ca 600m from the town centre and slopes. 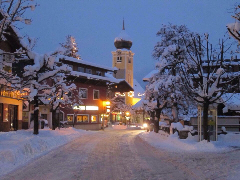 Westendorf is situated high up on a sunny plateau in the middle of the Brixen valley, far away from the hustle bustle of city life. It is a picturesque little village with amazing views from the surrounding mountains. Connected to Austria's largest ski area, the Skiwelt Wilder Kaiser Brixental and the well-known Ski Area Kitzbühel/Kirchberg. It is popular both in winter and summer.